I may procrastinate with nearly all important things in my life, but when it comes to Christmas shopping (or birthday shopping or just day-to-day pick-me-ups for those I love) I'm more eager to get the show on the road than those poor little gymnasts who can't start bouncing around until the judges blink the light. It only SEEMS preposterous to be thinking of holiday presents now, but when delivery takes five months, we're actually getting down to the wire. 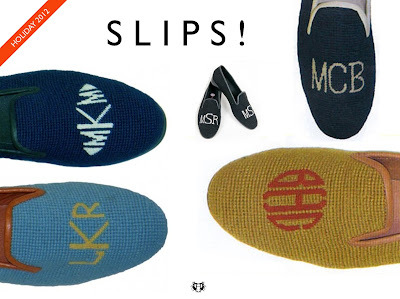 So, if you know someone who might appreciate custom needlepoint slippers this year, get clickin! They're about 300 smackaroos, but they'll be ridiculously adored and last a lifetime just like my dad's have.